If you are a patient being treated by our physicians, your clinical appointments will be at the N.C. Cancer Hospital on the UNC Health Care campus in Chapel Hill. UNC Lineberger’s administrative offices, along with some researchers’ offices and labs are located in the UNC Lineberger Building. If you are using a GPS or navigation system, type “UNC Hospitals” as your end point. The directions will take you to Manning Drive. You can get to all of the parking options from Manning Drive. From I-40 East: Take Exit 273 and head west on Highway 54 towards Chapel Hill. From I-40 West: Take Exit 273A and head west on Highway 54 towards Chapel Hill. Drive 3.1 miles on Highway 54 West. Merge right onto US 15-501 South. At the top of the ramp, turn right onto US 15-501. Go about 1 mile and turn right onto Manning Drive. UNC Hospitals is on the right. Chapel Hill Transit offers fare-free busing to the UNC Medical Center on many of its routes. Routes also serve the Family Medicine Center and the ACC. Schedule & route information. The Triangle Transit Authority also offers multiple bus routes to the UNC Medical Center from surrounding cities like Raleigh, Durham, Apex, Garner and Hillsborough. Schedule & route information. UNC Medical Center offers a free shuttle service to all hospital parking lots and decks, the Ronald McDonald House and Chapel Hill’s various Park and Ride Lots. These shuttles operate from 5:30 p.m. – 1:30 a.m., every day, including weekends and holidays. In addition, the evening shuttle service is available to help valet customers retrieve their vehicles after the valet desk closes at 7:30 p.m. If you have questions about evening shuttle service, please call 919-810-6957. Another overnight shuttle service for patients and visitors operates from 1:30 a.m. – 6:00 a.m. The free shuttle is available to transport visitors to and from all hospital parking lots and all Chapel Hill Park and Ride locations. The shuttle is stationed outside of the Emergency Department. If you need the shuttle service but are located in another part of the Medical Center, Hospital Police can contact it for you. 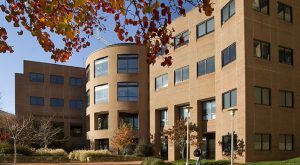 The Cancer Center’s administrative offices, along with some researchers’ offices and labs are located in the UNC Lineberger Building. The UNC Lineberger Building is a three-story red brick building with a small dome located at 450 West Drive (near the corner of Manning Drive and West Drive and across from the Cardinal Parking Deck).